When our entire family is healthy, happy and energetic, our world becomes a brighter place. For nearly 65% of the American households who consider their pet a family member, the healthy pets who are happy and well adjusted play an important role in family well-being. With annual routine vet bills averaging around $100 and doggie or kitty surgery likely to cost several hundred dollars, plus extras for x-rays and meds, it also makes financial sense to keep our pets healthy. up with. He remained . happy and energetic at age 14 while most of his Rottweiler buddies were dying of cancers at 8 or 9. He went to a vet only once his whole life. Let’s look at what it took to keep him healthy. The sad truth about most mainstream pet food brands is not pretty. Foods that are deemed unfit for humans are perfectly legal for pet foods. These unsavory ingredients include slaughterhouse wastes, diseased animals, spoiled supermarket foods (sometimes with the packaging intact), and even euthanized pet and farm animals can lawfully make up pet foods. Choosing healthy pet foods is not as easy as looking for the words premium or natural. To avoid choosing a dog food that might contain horrific ingredients, the best way to minimize the risk is to never buy products made with generic animal ingredients. In this case generic means animal based ingredients which do not specify the source animal. They use non-specific words like “meat” or “poultry”, rather than the actual species like “chicken” or “beef”. According to the pet food industry, meat can come from virtually any kind of mammal. So, unlike beef meal, which must come from beef, generic meat meal can legally be from road kill, dead zoo animals, horses, or… dead cats and dogs. This is not food for healthy pets. 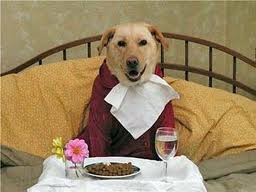 In addition, high quality pet foods will always be made from ingredients that are USDA approved for human consumption. Furthermore, just like when you shop for your humans, you should never buy pet products with artificial colors or preservatives. The books: Real Food for Healthy Dogs and Cats and Dr. Pitcarin’s Guide to Natural Health for Dogs and Cats are 2 of the best resources to guide you through the adventure of natural pet care. Based on those books and my own experiences I recommend the following approaches for keeping your pets healthy and your vet bills low. The best diet you can feed your dog or cat is a homemade, balanced,raw diet. However it’s fairly costly and time consuming to prepare. A homemade, balanced cooked diet supplemented with some raw foods would be next best. From a practical perspective, feeding your pet high quality dry kibble made from ingredients approved for human consumption and adding a homemade “booster mix” should provide your pet with everything they need to stay healthy. It will be reasonably priced and quick to prepare. You can easily prepare a weeks worth of booster mix in about 10 minutes, then just add some every day to your pets kibble. Mix with food processor or by hand. Adding approx 1 cup booster mix per day (less for smaller dogs) to dry kibble will provide your special “family member” with:. Essential fatty acids from the oils for healthy skin, coat, eyes and ears. Frequent use of pet probiotics will boost immunity and improve digestion. In addition, 1\4 to 1\2 teaspoon a day of Spirulina powder has brought back the “pep in their step” to many family pets in their golden years. Your whole family deserves to be healthy all year round. Plus in the long run, healthy pets will save us humans lots of money in vet bills.